Credit card declines are on the rise as cards are being issued at a higher rate for a variety of reasons including the rollout of EMV chip cards, expiring credit cards, banks switching card brands (example: Visa to Mastercard), fraudulent card activity or cards simply being reported as lost or stolen. According to publications released by major credit card issuers, 15% of recurring credit card payments decline. For some industries, that number can reach as high as 30%! If you’re an online merchant expected to receive $30,000 of revenue monthly, that’s a loss of $4,500 to $9,000 to your bottom line. The most commonly used method by merchants in updating card information is reaching out directly to customers either via phone, mail or email after a card is declined. Days, weeks and even months can go by before a customer calls back, resulting in loss of revenues or cutting ties with the customer due to no payment on their account. Only 5% of new card information on the first attempt is successfully gathered utilizing this manual process. Most recently merchants have partnered with Subscription Billing companies to help manage customer accounts, which has resulted in a business boom for this industry. Subscription Billing gives consumers the ability to manage their subscription accounts by adding multiple payment methods. These services help customers keep the subscriptions and services they love and merchants in the black by taking alternative payments if a transaction declines. While this method is highly successful for merchants, it also comes at a price as these services are costly and adds an additional expense for the business. GlobalOnePay’s Auto Account Updater is the easiest and secure way merchants can decrease credit card declines. It works simply by having our payment gateway communicate daily with the issuing card brands (Visa and Mastercard) via direct integration. The new card information is passed on securely to our gateway as a token where only basic information about the cardholder is stored. From there, merchants can process recurring payments seamlessly without any manual processes. 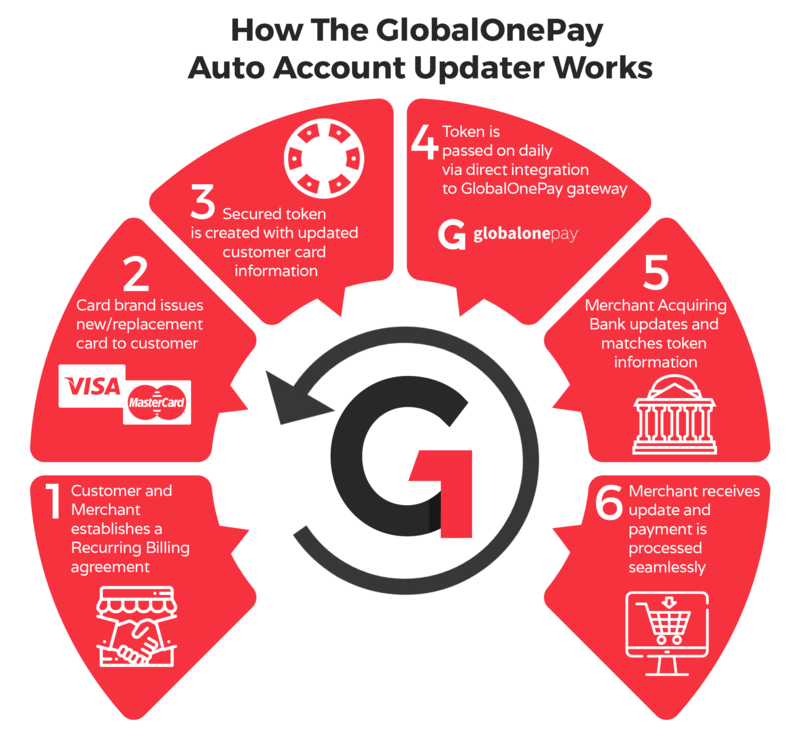 On average, GlobalOnePay’s Auto Account Updater updates between 3-5% of merchants’ customer credit cards each month. By subscribing to Auto Account Updater merchants ensure uninterrupted billing and avoid up to 5% of lost revenues and attrition. If your eCommerce business is ready to save time and minimize losses due to declined recurring billing transactions, contact GlobalOnePay and sign up for Auto Account Updater. This service can be added to your GlobalOnePay merchant account at any time without any long-term commitment. Contact our Sales Team to sign up today.